Claire’s amazingly well stocked medical bag seem to be the healer’s equivalent of Mary Poppins’ never ending carpet bag. Always prepared and ready for anything, Claire has got right at hand the remedy for whatever might be ailing ye! And for the record, this bag is FABULOUS and if anyone knows where I can get my hands on one, please share! Alex Randall’s condition has worsened significantly and he is dying of tuberculosis (more about TB here). 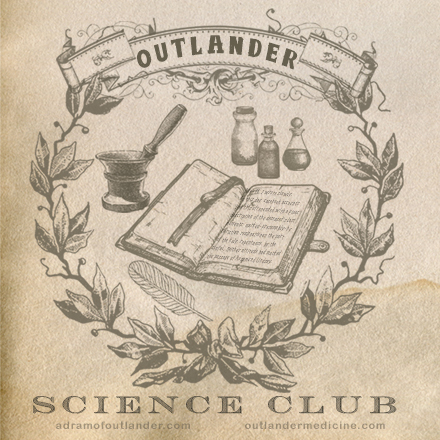 As is sadly becoming a common theme in Outlander, nothing can be done to cure Alex. In fact, prior to the mid-20th century, approximately 80% of people who developed active tuberculosis died of it. All that can be done is to provide comfort and dignity in his final days. Thornapple, also known as Jimson Weed, acts as a bronchodilator, opening Alex’s constricted airways via the action of atropine as well as reducing mucous production obstructing the flow of air. The leaf of the coltsfoot plant has been used historically as an inhalant to ease cough and wheezing. Its scientific name is Tussilago fanfara, (tussis – “cough”, ago – “to act on”), very appropriate given its expectorant, antitussive and anti-inflammatory effects. Smoking various medicinal herbs via pipe, cigarette, or cigar, was indeed an effective historical remedy for the symptoms of lung disease. These often contained Stramonium, aka thornapple! However, Alex is in such severe distress, he cannot purse his lips and draw breath from a pipe. Ever resourceful, Claire has a solution. Claire has contrived a way to deliver the medication to Alex, much like an inhaler and spacer. Alex can freely inhale the medicinal smoke without needing to try to take a forceful or deeper breath. And indeed, it seems to provide him some relief. Claire splits her time between caring for Alex Randall in his final days, and attending to Colum MacKenzie, who continues to suffer debilitating pain from the destructive Toulouse-Lautrec Syndrome. An alcoholic solution containing opium. Used primarily as a pain reliever. Also used as a cough suppressant and for the treatment of diarrhea. Overdose and death can occur with as little as 3 teaspoons in those unhabituated to opiates. Colum asks Claire to give him a quick death, like Geillis Duncan gave her husband Arthur. Well, as it turns out, Arthur’s demise wasn’t all that quick. (See the post What Was Ailing Arthur Duncan!) After trying to kill him for months by poisoning him with arsenic, and causing unending gastrointestinal misery, Geillis ultimately dosed Arthur with cyanide and he dies a quick, though agonizing and quite public, death in the Great Hall. Well, that sounds like a much better option. Except for the fact that yellow jasmine might also cause an agonizing death. The symptoms of yellow jasmine toxicity are depressed respiration, tremors, paralysis of the extremities, convulsions, urination, defecation, retching and salivation. In large doses (as Claire gave Colum), it paralyzes the respiratory centers. Large doses paralyze the spinal cord and cause almost complete loss of muscular power. Death is due to asphyxiation. In order to allow Colum to drift peacefully off to sleep, perhaps Claire has added a very strong sedative? It would have taken A LOT of laudanum to have this effect on Colum, as no doubt he has been taking large doses of laudanum regularly for many many years and is quite habituated to it. But then, she does have that medicine bag of wonders and perhaps is able to whip up something to quickly cause sedation so that the yellow jasmine could take its effect without causing undue distress. Gelsemium in lethal doses paralyzes the nerves, both sensory and motor. The motor nerves are first influenced, the paralysis of sensation more slowly following. The writer observed a case of poisoning where the patient had taken sixty minims of the fluid extract within forty-five minutes. A sensation of general oppression occurred rather suddenly. The patient rose to her feet, noticed that vision had failed almost completely, walked two or three steps, then fell in a mass upon the floor in a state of complete muscular relaxation. There was no alarm or fear, a rather tranquil feeling mentally, and in this case there was no great difficulty of breathing, although we have observed dyspnea from single doses of two or three minims of the fluid extract. The recovery of this patient was rapid, although muscular weakness was present for several days. From the American Materia Medica, Therapeutics and Pharmacognosy by Finley Ellingwood, MD. 1919. Pages 225-6. In the end, Colum ended his life on his own terms, and hopefully in the peaceful way Claire intended. And here is a fun find for those who like quirky historical medicine facts… Enjoy! Other Applications for Medicinal Smoke? Interestingly enough, tobacco smoke enemas were actually used in the past for the treatment of a number of different ailments such as gut pain and in the resuscitation of drowning victims. Indeed, it is the origin of the term “blowing smoke up your arse!” Let’s hope Claire doesn’t find a need to explore this modality further! What was ailing poor Arthur Duncan, who always seemed so uncomfortable? Claire and Geillis are unceremoniously dropped into the thieves’ hole where they have a bit of time to bond as they await their fate. Claire confronts Geillis about Arthur’s death and Geilis admits that she did poison him with cyanide but only after trying for months to kill him with arsenic! Indeed, Arthur appears ill every time we see him, suffering from various stomach ailments and discomfort. Even Claire was stumped as to what may have been causing his trouble. The symptoms were rather puzzling; not like ulcer, I thought, nor cancer- not with that much flesh still on his bones- perhaps just chronic gastritis, as Geilie insisted. But now it is all so clear. Arthur has been suffering the effects of chronic arsenic poisoning all these months. Arsenic is ubiquitous in the environment, found in ground water most commonly, and also a byproduct of mining and smelting metals. It has been used medicinally for over 2400 years in traditional Chinese medicine and also used to treat syphilis in the western world before the development of penicillin. In the Elizabethan era, women used a mixture of vinegar, chalk and arsenic which they applied to their faces in hopes of preventing aging and creasing of the skin. Arsenic is an ingredient in green pigments used to color most anything – wall paper, textiles, paint. Arsenic has been a favored poison throughout history. Tasteless and odorless, it was an easy choice. It is particularly known to have been used by the Borgias in Italy and is also thought to have been responsible for the death of Napoleon Bonaparte. In the 19th century, arsenic was dubbed “inheritance powder” because it was suspected that many impatient heirs ensured or accelerated their inheritance by means of poisoning with arsenic. The most toxic form, white arsenic, or arsenic trioxide, is of course what Geillis chose. Arsenic poisoning is due to ingestion most often, but also occurs via absorption through the skin and by inhalation. Arsenic is readily taken up by the red blood cells and distributed throughout the body, and is particularly toxic to the gastrointestinal system, kidneys, bone marrow, skin and nervous system. White arsenic binds to and interferes with numerous enzymes in the cells of the body, wrecking havoc on normal cell function. Symptoms after acute poisoning develop in minutes to hours and generally begin in the gastrointestinal system causing nausea, vomiting, abdominal pain and severe watery diarrhea. It can cause a garlic odor on the breath and in the stool. Severe poisoning leads to abnormal heart rhythm, shock, acute respiratory distress and death. What Arthur suffered, however, is chronic toxicity – long term exposure of lower levels of arsenic. The symptoms come on more slowly but still have significant consequences. Chronic exposure leads to abdominal pain, nausea and diarrhea as well, but also skin lesions, peripheral neuropathy (numbness and tingling, then intense burning pain to the hands and feet), cancer of the skin, bladder, lungs and liver, type 2 diabetes, and respiratory problems. We’ve witnessed Arthur suffering with abdominal distress just about every time we’ve seen him. He’s been treated with peppermint by Geillis and fennel from Claire for his discomfort. These provide temporary relief but won’t cure him. But alas, when that doesn’t do poor Arthur in, Geillis employs another technique and Arthur meets his end by cyanide poisoning. By the light of the full moon and clearly in her element, Geillis Duncan reveals to Claire that she loves Dougal MacKenzie and is pregnant with his child. Maura MacKenzie, wife of the war chief has conveniently and suddenly died, leaving only Arthur Duncan in the way of these star-crossed lovers, or so it seems. The Duke of Sandringham has arrived at Leoch to take counsel with the Laird and hopefully to be of some help to Jamie in securing a pardon from the murder charges he faces. A banquet is held in his honor and all associated with the clan enjoy the lavish feast. The Laird of the MacKenzie offers a toast to his longtime friend and ally, His Grace, the Duke of Sandringham. Everyone drinks, the food is passed, and merriment ensues. Arthur Duncan suddenly stands, coughing and apparently choking. His hands grasp at his throat and he collapses to the ground. Claire rushes to his side to help but quickly it becomes clear that he cannot be saved. She smells bitter almond and recognizes the scent as that of cyanide. Arthur Duncan has been poisoned. Knowledge of the poison cyanide may date back as far as ancient Egypt, as “death by peach” has been translated from Egyptian hieroglyphics. In more modern history, cyanide was used by the Nazis in extermination camps and later ingested by the Nazi leaders themselves as they committed suicide as the Russian forces approached in 1945. The mass suicide of 912 cult members in Jonestown in 1978 was due to a cyanide-laced kool-aid type drink. Saddam Hussein included cynanide among the chemical weapons used against the Kurds in the 1980s. The still unsolved mystery of cyanide poisoning in Chicago in the 1980s in which random containers of the medication were spiked with cyanide led to the universal tamper resistant packaging we now have in over the counter medications. Cyanide is simply a carbon atom bound to a nitrogen atom and is a very potent poison, found in many foods and manufactured items. It is found in the pits and seeds of bitter almond, cherry laurel, apricot, plum, pear, peach and apple as well as in cassava root, bamboo and soy. Some species of centipedes, millipedes, beetles, moths and butterflies synthesize and excrete cyanide for defensive purposes. When burned, wool, silk, polyurethane and plastics like cyanoacrylate (superglue) emit cynaide gas. It has even been used as an insecticide and to fumigate ships and buildings. The major source of cyanide poisoning now is smoke inhalation from residential or industrial fires in which cyanide is released as plastics and textiles burn. Cyanide exposure can occur by inhalation, ingestion or even absorption through the skin. It then enters the blood stream and is distributed rapidly throughout the body. Cyanide irreversibly binds to and inactivates energy pathways in the cells, leaving them unable to absorb oxygen or produce energy, resulting in cell death. The cells are in effect suffocating, unable to use the plentiful oxygen available. The heart and brain are especially dependent on the body’s oxygen supply and the effects on these organs is particularly deleterious. Within minutes, the victim of cyanide poisoning will begin to experience symptoms: Headache, anxiety and confusion will progress to seizure and coma. An initially elevated heart rate and blood pressure will progress to severely low heart rate and blood pressure, heart block and cardiac arrest. Pulmonary edema, or accumulation of fluid in the lungs will cause coughing of frothy sputum and progress to respiratory failure. Vomiting, kidney failure and liver failure occur. Death occurs in minutes, depending on the dose. Antidotes for cyanide poisoning are available. Those patients who receive a dose of cyanide that is not immediately fatal and receive prompt medical care can be treated with medication that binds the cyanide in the blood an allows it to be eliminated via the urinary system. However, cyanide is so quickly acting that those who receive a fatal dose will almost always die before they can reach medical care and receive such an antidote. The episode ends on a painfully familiar note. Our Claire again sits locked up in the back of a wagon. Indeed something wicked this way comes!